Red Pro 5 T ShirtsPro 5 T shirts are the thickest t-shirts with the tightest necks in urban fashion. Pro5shirts.com is a retail store that sells Pro5 Clothing. We Do Not manufacture the Pro 5 Clothing available for sale. Our Pro 5 shirts and other apparel available for sale are purchased directly from the Pro 5 Clothing Manufacture. Pro 5 T shirts are pre-shrunk and made of 100% cotton. Our Super Heavy Weight Pro 5 T shirts are available in 12 fashionable colors. Choose from black, white, red, navy blue, gray, and much more. Our Pro 5 T shirts come in many sizes from small up to 7X. Pro 5 T shirts are the thickest t-shirts with the tightest necks in urban fashion. The extra thickness found in each Pro 5 t-shirt compared to other plain t-shirt brands keeps hip-hop fans coming back for more of our fresh Pro 5 tees. Pro 5 T shirts are simply the heaviest tees predominantly worn in urban neighborhoods all over the map. Get your Pro 5 tee today at a bargain price. White tees come in a pack of 3 Pro 5 T shirts. Black and colored tees come in packs of 2 Pro 5 T shirts. 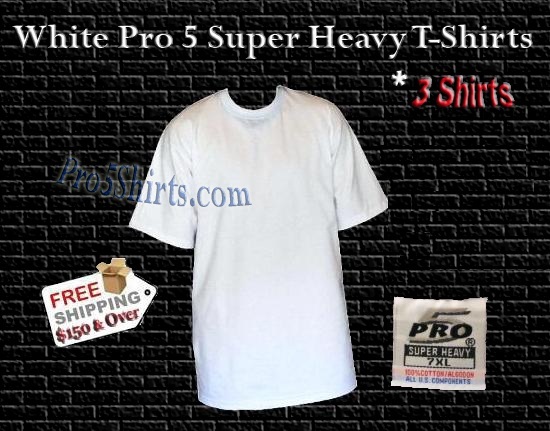 White Pro 5 T ShirtsWhite Pro 5 T shirts are the thickest t-shirts with the tightest necks in urban fashion. Charcoal Pro 5 T ShirtsCharcoal Pro 5 T shirts are the thickest t-shirts with the tightest necks in urban fashion.